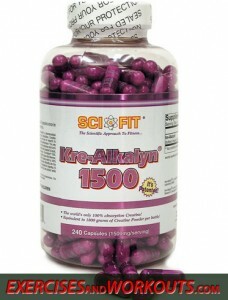 Kre Alkalyn 1500 by Sci Fit is best and most cost effective creatine I have used, so far. I have used creatine mono hydrate powder and loved the results but my only complaint is how difficult it is to consume that tasteless powder every day. And the flavored creatines were no better. Kre Alkalyn is in pill form and is easy to pack with you to take after a workout. As mentioned before, Kre Alkalyn is friendly on the budget. Supplements can get expensive over time especially if you are stacking. Right now my stack consists of Sci Fit’s Kre Alkalyn, BSN’s Nitrix, USPLab’s Jack3d and Optimum Nutrition’s Gold Standard Whey protein. Because there is already creatine in the Nitrix I would recommend downing the dose of Kre Alkalyn from it’s normal suggestion. Every person reacts differently to bodybuilding supplements. The suggestions in this review work for me as a tall person that has trouble putting on weight, also known as a “hard gainer”. Always asses your situation appropriately. Sci Fit advertises their creatine as having no side effects, but I will leave that claim up to them to defend. This entry was posted in Bodybuilding, Supplement Review and tagged bodybuilding supplements, Creatine by Russell Jensen. Bookmark the permalink.